This gallery showcases mudroom ideas with a wide variety of home styles and decor. 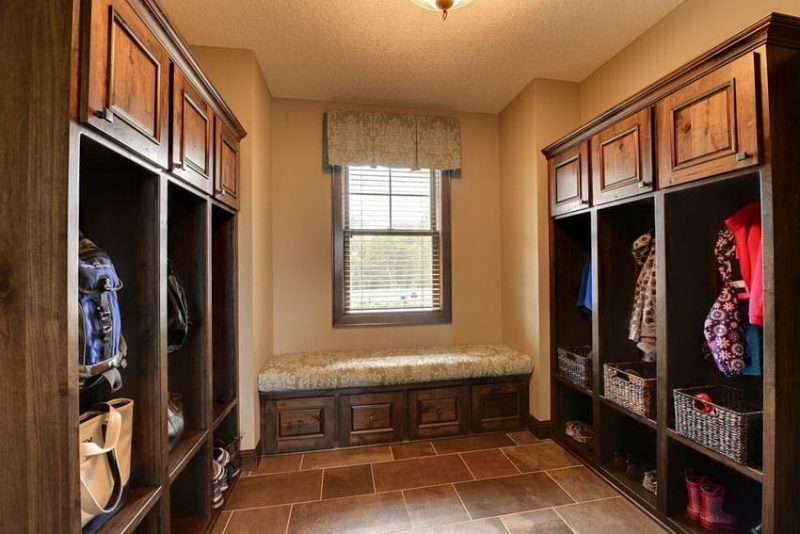 A well equipped mudroom provides a place where outerwear, and shoes can be removed before entering or leaving the house. 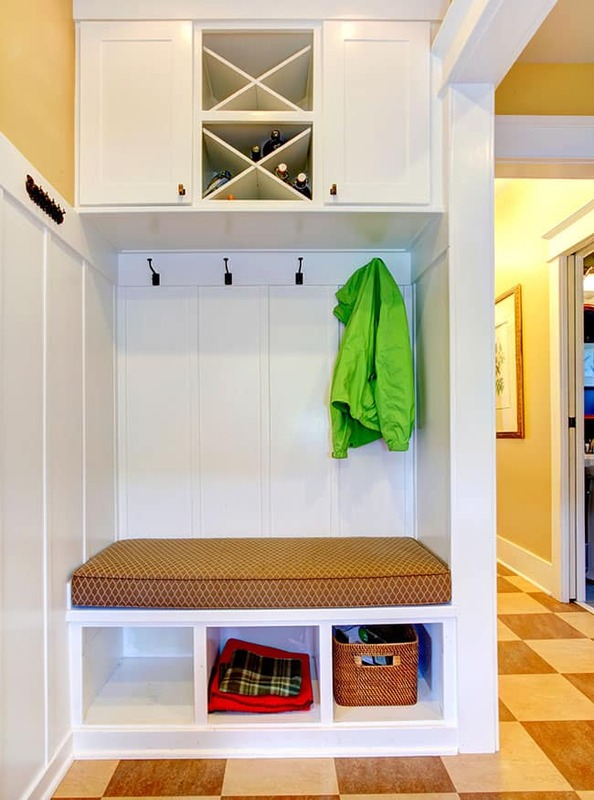 The best mudrooms are equipped with storage cabinets, benches shoe cubbies and offer weather resistant flooring for kids and adults to remove wet clothing items. The mud room is a hard working space that is designed especially to help keep the home clean and efficient for family and friends. The mud room in the picture above features all-white walls starting with a white painted wood panel base. A pair of hall trees, each with three mounted hooks and overhead storage space, also comes with a small non-upholstered seat with pull-out drawers beneath. The rest of the room is done in a grainy beige tile and is filled with wicker basket accents. 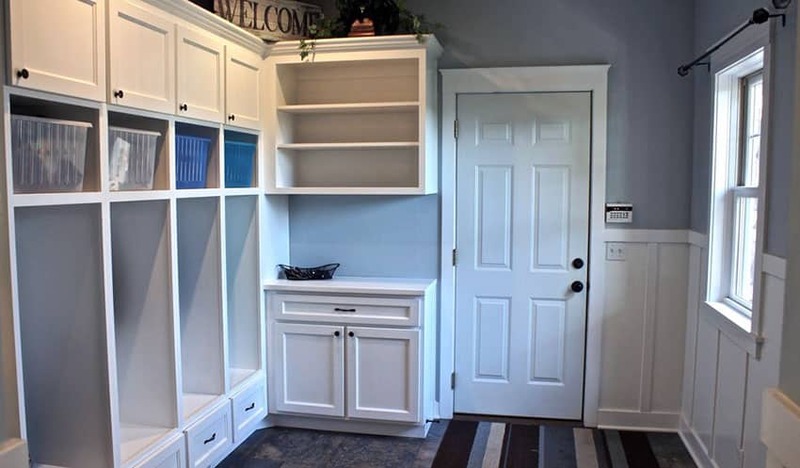 Mudroom Furniture – There are a variety of choices for mudroom furniture including cabinets, shoe cubbies, console tables, freestanding coat racks, freestanding shelving, benches and chairs. 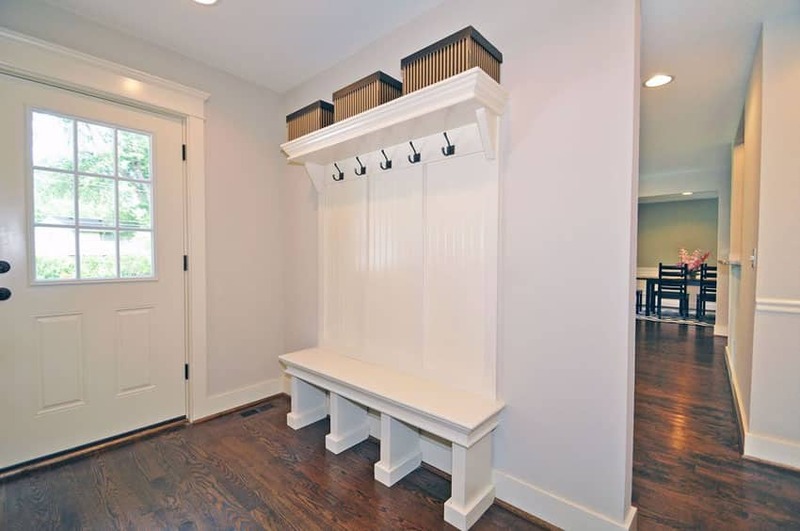 Low bench – The low bench is a standard for most mudroom furniture, providing ease for putting on and removing shoes, heavy coats, etc. It’s also a good landing zone for larger items to be brought in such as groceries, sports equipment and other household tools. Hall Tree or Built-In – A hall tree or built-in cabinet is a place for storing coats, jackets, hats and other clothing. A hall tree is the simplest way to decorate a mudroom, with store-bought ones being lightweight and affordable. 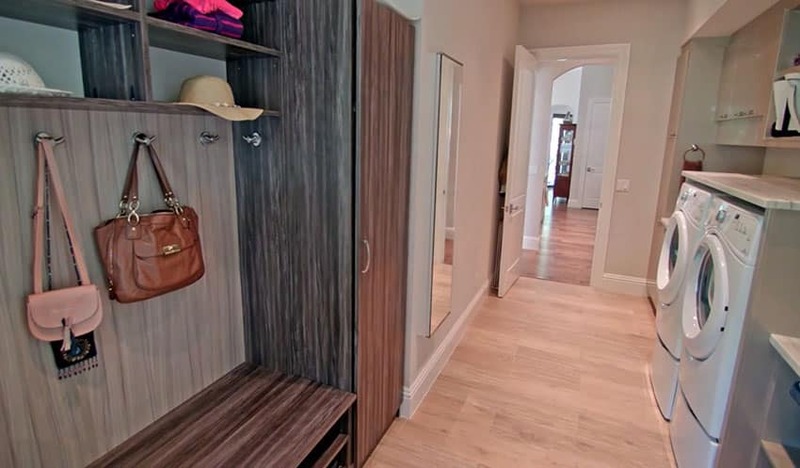 The typical hall tree should have some cabinet space, shelves, hooks and a low bench. 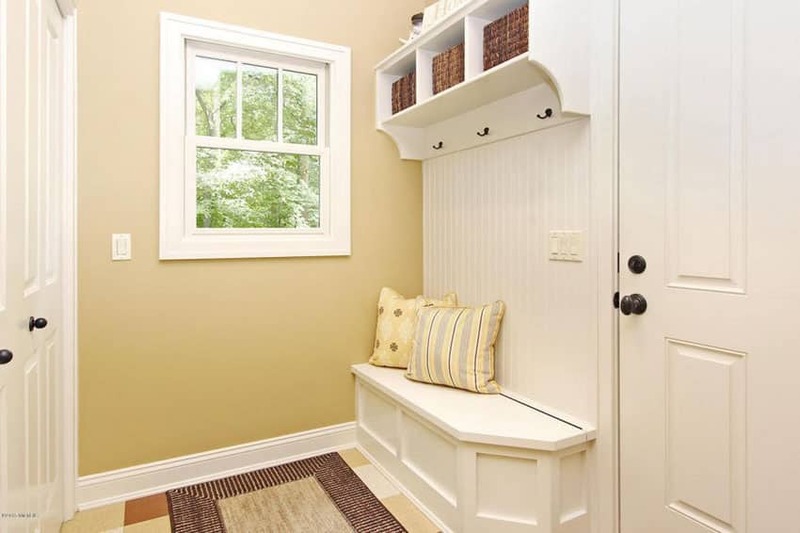 Bigger budget mudrooms could go for a built-in along the hall, which can be recessed into the wall or used as a space for decorations.While built-ins typically can be customized to suit the needs of the family and are able to provide additional storage space or a comfortable low bench. Rug or resilient flooring – As the link to the house’s exterior, the flooring should be able to handle dirty boots, heavy coats and other things that need to be brought in from the outside. Some mudrooms may employ a different type of flooring from the rest of the house. This could mean using a certain kind of vinyl or ceramic tile. Others may opt to have the same type of flooring for their mudroom, protecting the floor instead by providing a rug or mat. Accent back wall – The back wall of the open recesses where coats are hung may sometimes differ from the finish used for the rest of the casework body. Besides being a good accent, as it is eye level and makes up a bulk of the built-in’s visual space, having a backing more suited to heavy use is important for the built-in’s longevity. 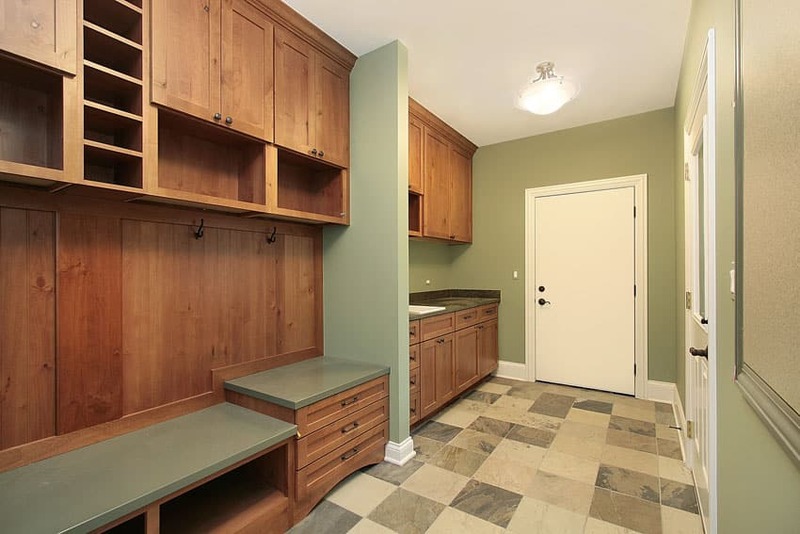 Mixed-Use area – Sometimes the mudroom can be mixed with other parts of the house. 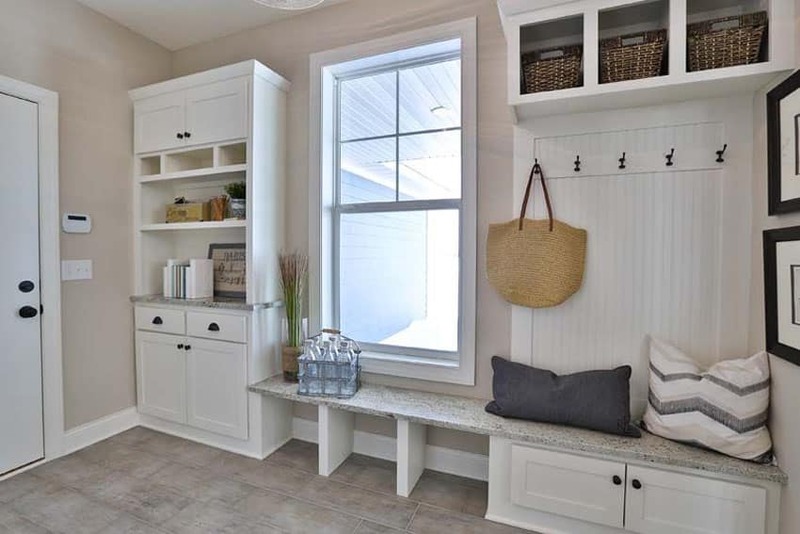 A typical example is creating a space that features both the mudroom and the laundry area, as it will be easy to bring clothes outside to dry or back in for washing. In addition, both are considered “service areas” in a house, so both would be towards the back, concealed from most of the house’s living areas. The mudroom can also be combined with a small work area, where a desk space can be set up and storage options exist plentifully. Lastly, combining it with the main entrance is also possible, as built-ins can easily be flushed to the wall, ensuring that the main entrance has ample storage space without disrupting the aesthetic and flow of the entrance hall. Storage accessories – Built-ins may be expensive but simply deciding to utilize purely open shelves for the casework can mean a lot of savings. 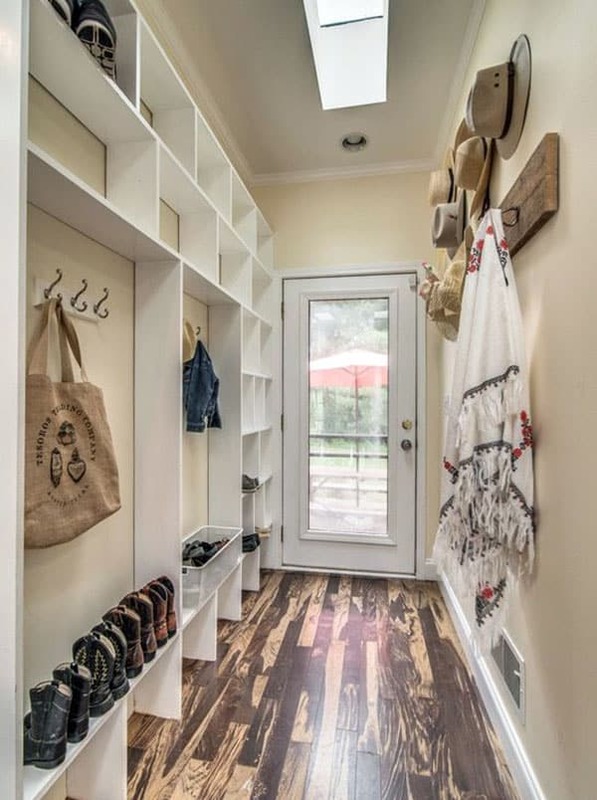 In order to protect the things in open shelves from dust and sunlight, simple storage boxes made of wicker, fabric, plastic or wood tucked into the shelves is a great way of organizing, concealing and protecting mudroom storage. These baskets can also be customized or decorated in order to fit the mood or theme of the mudroom or the entire house. Door to outside – Mud rooms are typically a “service area” which serves as a link from the outdoors or garage to the inside of the house. The door typically needs to be of sturdy construction, although a little less ornate than the front door. The door may also usually include panes of glass to let in some light into the small room. Many mudroom ideas start as a second entrance to the home that becomes a high traffic space that is separate from the main entry. Featuring a more classic look for this mudroom, the light green fabric with white embroidery used for the curtains is also used for the upholstery on the bay window seating right below it. The seat features a series of four dark wood paneled pull-out drawers. On either side of the room, two large built-ins are in the same dark wood paneling and offer closed cabinet space at the top and open racks below it to hang coats and jackets. A lower shelf provides space for shoes and boots. The flooring used here is a combination of brown and beige tiles. 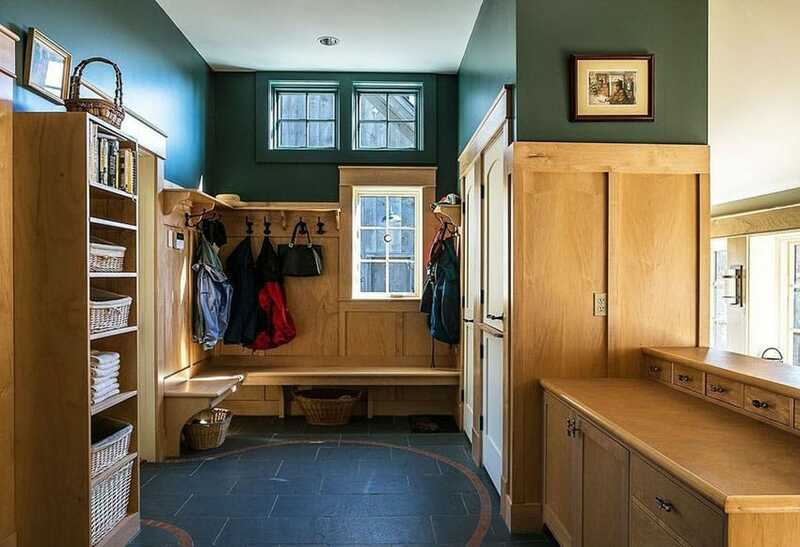 Although small, this mud room leads directly to the house’s main hallway. Leading in from a glass paneled white door with fanlight and mullions, the walls are decorated in white paint with accents of black picture frames. 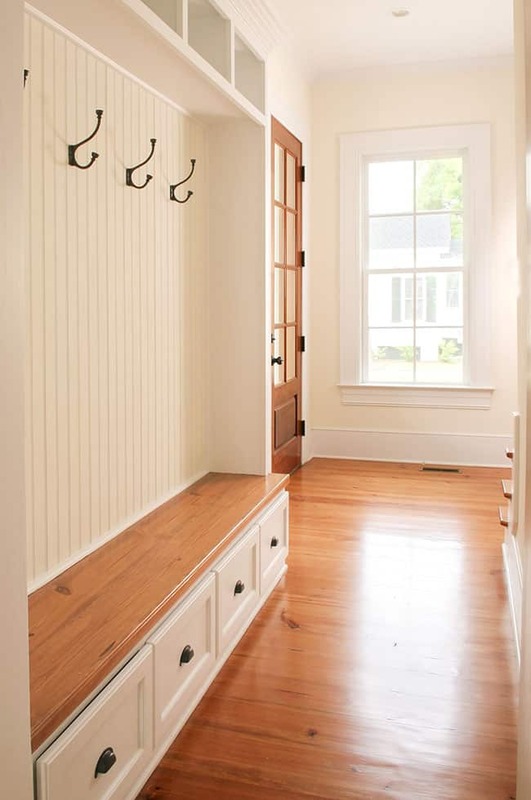 The length of the mudroom features a white back wall in vertical slats with a plate rail cornice above. The top part of the wall features hooks, while below it, a bench in black and white chevron upholstery was placed. A long grey area rug also runs along the room’s length, protecting the beautiful dark wood panel flooring. 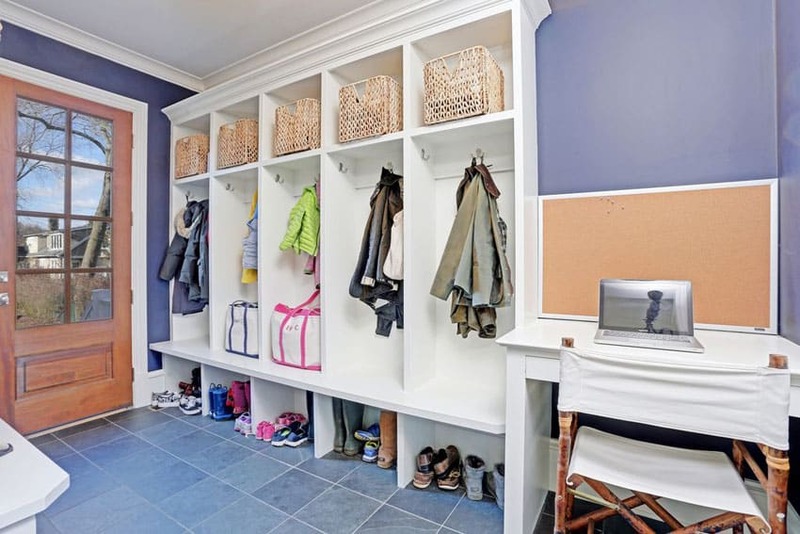 This colorful mudroom is ideal for a large family with a spot for each child to have their own cubby space for clothing, shoes and outerwear. The large cabinet features a wooden bench for putting on shoes and an overhead bin. 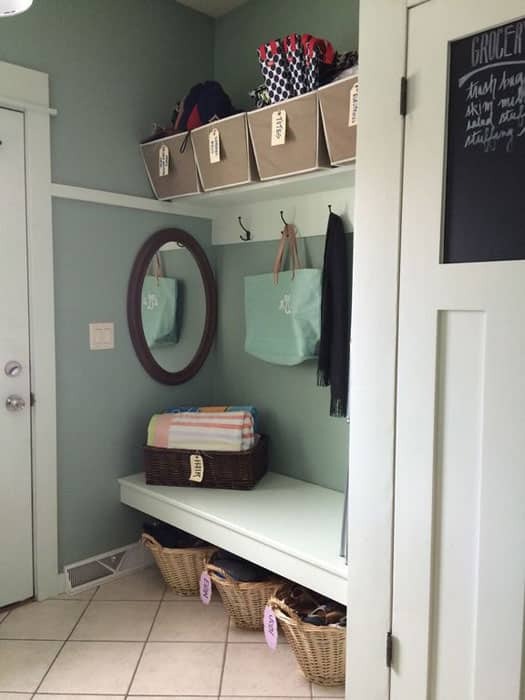 When considering mudroom ideas for a large family on the go, using color coated storage bin is a great way for kids to quickly find their items and keep clothing items individually separated. 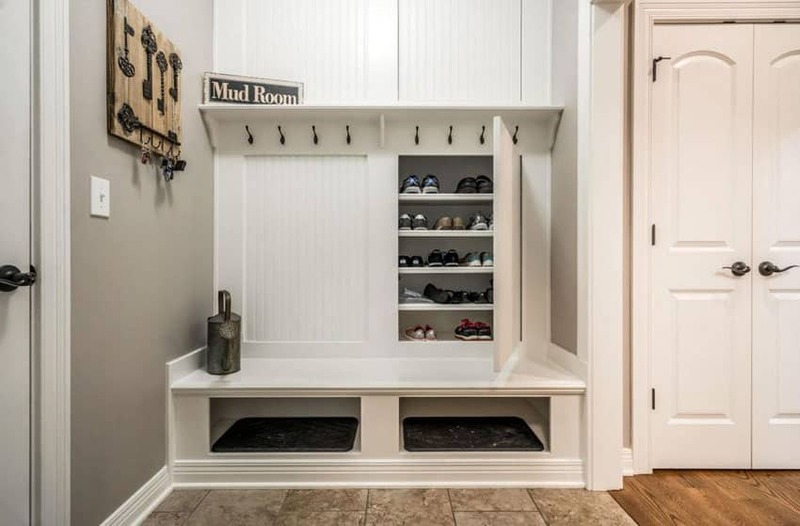 Even a small niche on the wall can be a fully functioning mudroom or mud area, with built-ins flushed into the wall in three separate openings. Each opening features an upper shelf, which can be used to hold décor and accents, a large middle section with hooks and padded seating, and an open shelf on the bottom where storage baskets can be stored. The floor features a dark brown rusticated tile in an alternating layout. Ocean green walls and slate grey floor tiles give this house a cooler, more relaxed tone. White accents in all of the caseworks, the doors and windows really pop from the duller hues used on the floor and walls. A door from the outside features a mullioned window matching the double hung window near to it, providing tons of natural light. 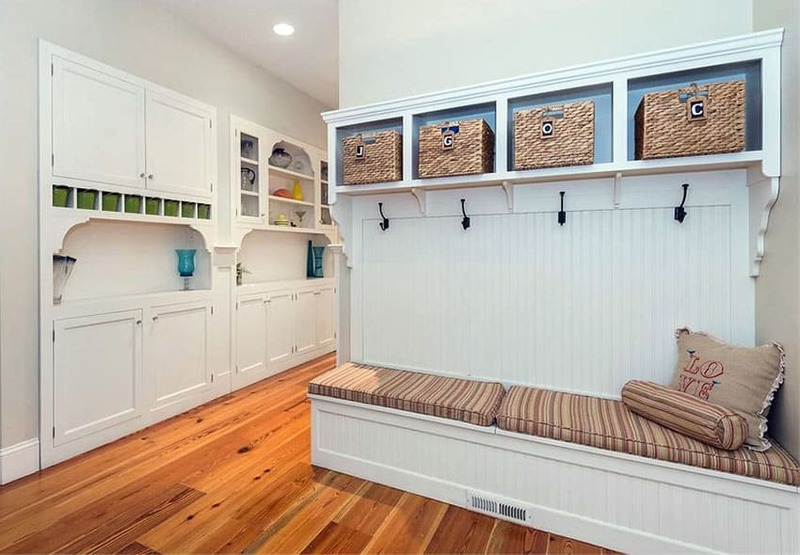 A low mudroom bench runs from wall to wall with storage drawers underneath. Hanging cabinets have also been installed with closed cabinets, open shelves and several hooks. With off-white cream walls and a light grey tone for the tiles, the white and grey marble stone used for the bench top is a unique natural finish to add to this Classic style mudroom. The marble is held up by two vertical white painted wood fins and decorated with accent throw pillows in blue and grey, and other indoor décor. A large double hung window separates one end of the room, a tall cupboard with closed cabinets and open shelves, from the other end, overhead open shelves with hooks below it, mounted on vertical white painted wood slats. Leading into the living space, a lot of natural light comes in from the pair of double hung windows and the door with glass panel, lighting up the light grey stone tile used on the floor. Striped green and brown pillows are set atop the wooden window seat bench, painted in a medium grey color and featuring underbench storage drawers. The open part of the floor to ceiling casework features wall hooks. 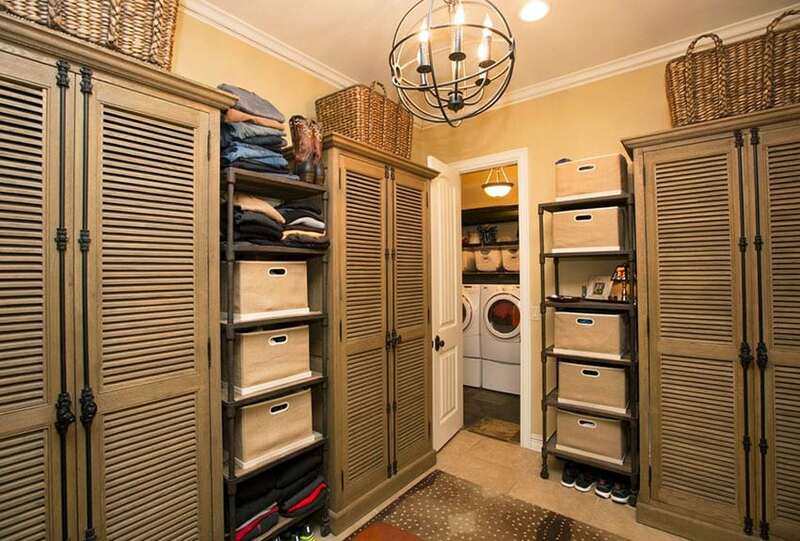 An efficient mudroom with storage cabinet. It features a dark wood finish for the main door leading into the mudroom with its rectangular brown and beige floor tiles. The corner features olive green painted wood paneling at about two-thirds height of the room with white paint on the walls and ceiling above it. The built-up is also in olive green and features four identical open shelf sections with hooks. Beside this is an open area where a white mullioned window provides light. The low bench part of the whole built-up features pull-out drawers at the bottom. This small narrow mud room features a white door with window panels leading into the space with dark colored stone tile flooring. On the left is a vertical wood paneled wall painted white, with hooks at its upper portion, terminating in a plate rail. Below it is the low bench in white, decorated with blue accent throw pillows. Across this section are four identical open shelves with the center larger than the others and equipped with coat and umbrella hooks. A large glass paneled door leads into a narrow room featuring zebra wood floor strips laid out linear to the length of the long mudroom hallway. To one side, a wood plank decked with mounted hooks is set beneath an assortment of safari hats mounted on the wall. To the other side, a narrow casework goes from floor to ceiling, all in an open shelf configuration, and with different sizes to suit different storage needs. A long narrow skylight at the top of the corridor lights up the entire length of this modern vintage mudroom. Leading into the main house, the mud room features a gritty stone tile for its floors, compared to the warm wood planks used for the rest of the house. The casework is devoted to just the back wall, with the vertical bead board trim running faithfully from floor to ceiling. A ledge at the very top serves also as a cove for the army of hooks mounted onto the wall. Below it is an artfully concealed cabinet with rows of shelves for shoes. A wide low bench is ideal for seating as well as additional décor, while the lower open shelves cater to the dirtiest of shoes with the installed rubber mats. With pale walls of blue grey, this mudroom has a quaint cottage feel, especially with the variation of area rugs on the floor in black and blue patterns. The corner to the side of the door is occupied by a built-in with a variation of open white wood shelves, drawers and cabinets. Right across this built-in is a large double hung window that provides natural lighting. From the door leading into the outside, the whole corner of this mud room features a low bench in warm wood with white painted wood paneled cabinets below. 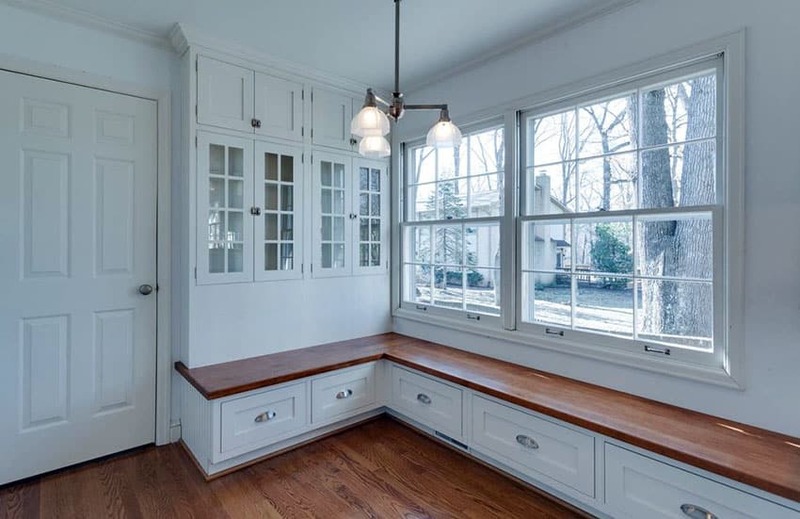 The longer side of the bench features a series of mullioned double hung windows while the shorter side features glass cabinets with white mullions. The wood plank flooring matches the wood grain used for the low bench and a modern hanging chandelier defines this mudroom. The hallway leading to the main mud room features several cabinets and arched display shelves in white painted wood recessed into the light grey wall. Light wood planks run along the length of this hallway and into the mudroom. A corner of the mudroom is fitted with a low bench upholstered with beige pinstriped cushion with a vertical white wood strip back wall terminating in a series of hooks and overhead shelves with matching wicker baskets, a more convenient way to store and reach than built in drawers. Sandwiched in between two white doors and a diagonally laid out beige tile floor, the mudroom in this house is limited to one wall but it serves its purpose. To match the room’s ocean green walls, a white painted wood low bench is installed here with a hanging ledge above also in the same white wood finish. The area features coat hooks, as well as wicker baskets below the bench and fabric baskets above the shelf. A linear mudroom features clean white walls and pale wood plank flooring leading in from the door. To one side, the wall is changed up to horizontally set white painted wood planks with a dual level of low bench and work desk in a warm wood finish mounted to the wall. The desk features thin desk drawers and a vintage wood and metal stool. Above it hangs a patterned glass cabinet and to its side hangs an assortment of open cube shelves. Below it are coat and bag hooks separated by curved fins supporting the shelves. More cubical shelves are found beneath the low bench. 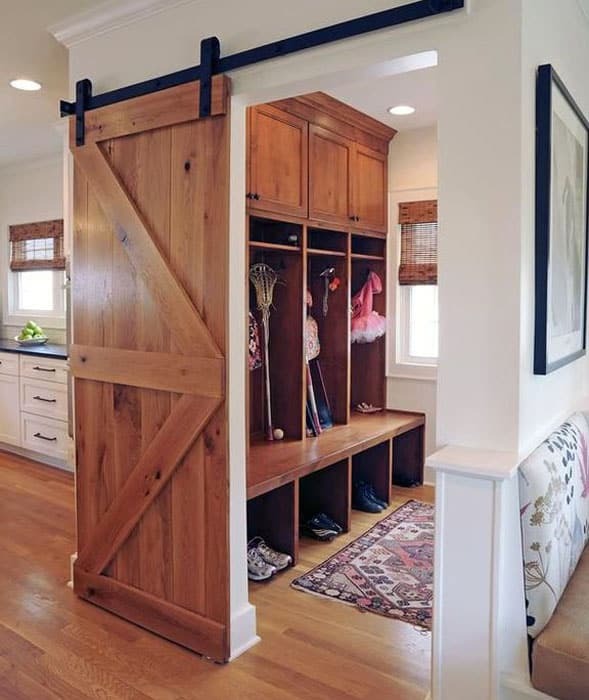 Artfully separated from the rest of the house using a beautiful vintage barn door on black metal tracks, this mudroom is small and easy to conceal. The mudroom contains a built-in stretching from floor to ceiling featuring a wood finish similar to the wooden floor planks. The casework features overhead cabinets, three large openings with racks, a low bench spanning its width and a below bench storage area for shoes. A patterned rug in shades of beige and maroon is set at the center of the room, in line with the double hung window at the end wall. Black tiled floors and dark emerald painted walls emphasize the fine grain of the light colored wooden finish used in the casework around this mudroom. To one side, a double height low cabinet piece is set under a long horizon mirror. Beside that, flushed into the wall, is a cabinet and the door to the outside. The back wall features a pair of clerestory windows as well as a larger white mullioned window below it, with the light wooden trim tracing around its edges. The low bench is also installed along the length of this wall, with additional storage compartments and baskets beneath it, and on the corner the hanging shelf with hooks are set in an L-shaped configuration. A tall shelf is set beside this low bench and fitted with low wicker baskets for extra storage space. Although of an irregular shape, this mudroom features efficient cabinetry in a heavy grained wood finish, matching the rusticated stone tiles for its floors. Dark wood paneling lines the walls of this room from floor to ceiling, and the main mudroom casework follows suit. Decked in heavy grained wood, the casework starts with a low bench with underbench drawers. Above it are hanging cabinets, with the hollow beneath it separated into sections with hooks for coats and bags. 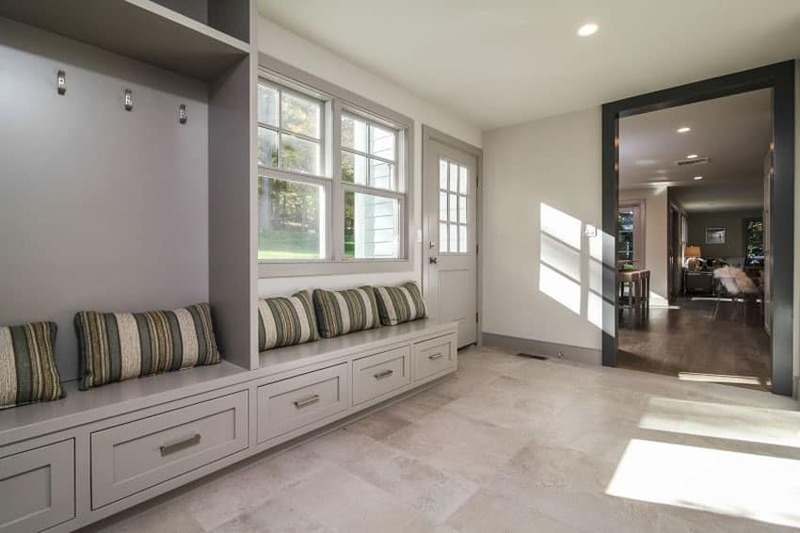 Leading into the main living space, this mud room features walls set in light grey painted wood planks, matching the light brown wood tile used for the floors. The area nearer to the living area features a working nook with cubes of open overhead shelves and cork board backing. The dark wood stained desk top is held aloft by a white painted wood paneled base with drawers and cabinets. Taking a contemporary vintage approach, the upholstered modern white chair matches the mismatched vintage desk lamps. Towards the back of the room, a set of three recesses pushed to the wall features a low bench, coat hooks and overhead shelf space done in the same white painted wood finish. 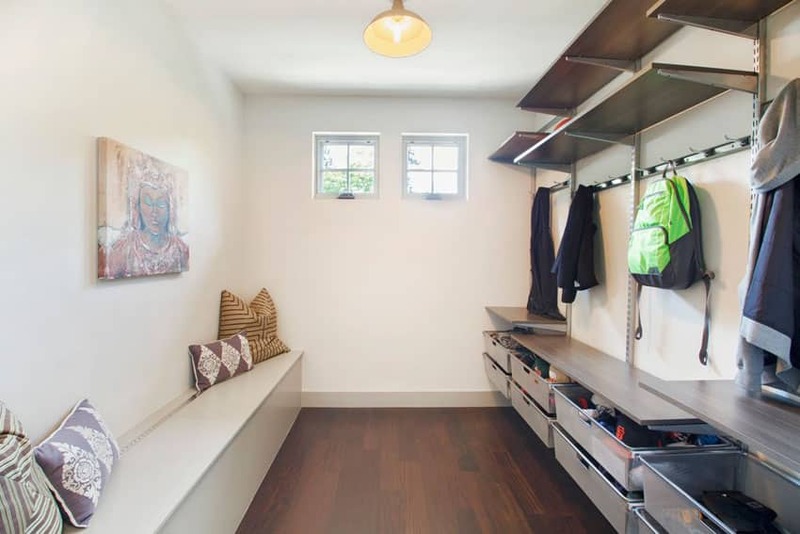 This linear mud room features white walls with the right side lined with washing machine and dryer as well as light grey painted wood cabinets and shelves. On the opposite wall is a tall cabinet and low bench with hooks and overhead shelves in a dark grey wood finish, contrasting with the light wood finish used for the wood plank flooring. Perfect for the modern outdoorsy family, the right wall features a lot of metallic overhead shelving, low drawers and a long strip of hooks and rails embedded into the wall. Opposite that is a more tranquil looking setup, a white painted wood low bench runs along the length of the room, highlighted with accent throw pillows and a decorative painting. The flooring is done in a dark wood finish, terminating at the back wall with two small square windows. A hanging industrial lamp lights up the entire space. 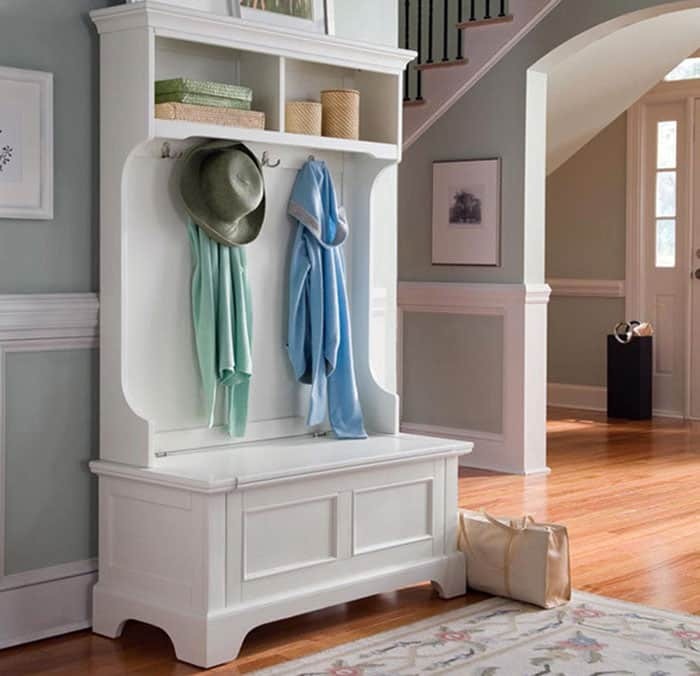 A small corner mudroom features white painted wood caseworks, starting with a full length double door cabinet. Opposite this, the wall features vertical white painted wood slats with overhead shelves supported by fins separating wall hooks. A low bench is also done in white painted wood, decorated with orange accent throw pillows and supported by a paneled wood base. The room itself features a light brown shade for the walls as well as the floor tile used in conjunction with a darker colored area rug. The walls of this mudroom are painted a vibrant shade of mauve, matching with the jean blue floor tiles. The entrance French door is in a nice warm wood finish with a short wooden kick plate at the bottom. A five-section casework set in white painted wood features matching low bench with storage, wall hooks and overhead shelves with wicker baskets. Beside this is a simple desk done up in the same white painted finish matched with a white fabric and wood seat and a cork board desk backing. This mudroom carries the classic theme of this house with its combination of sea green painted walls, clean white trims and warm wood diagonal layout plank flooring. Across a large wooden console table with drawers is a simple modern style bench painted black, with space underneath for two wicker and fabric storage baskets. 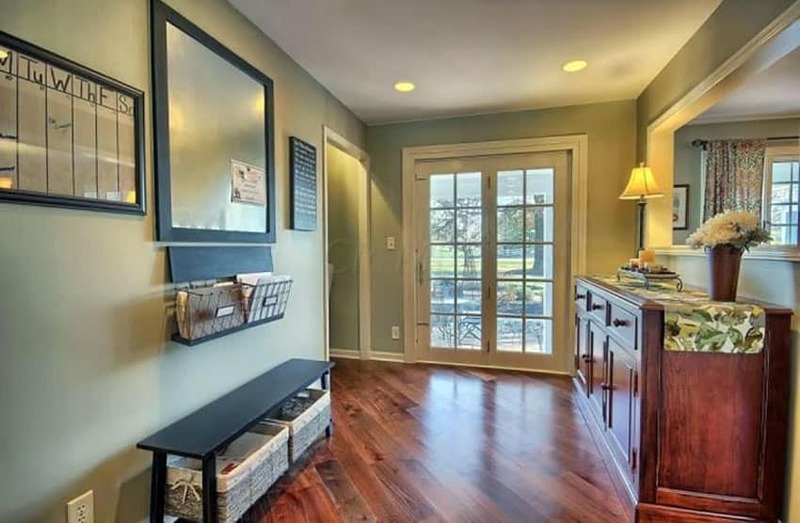 The mudroom space is further defined by a large horizontal mirror above with black edges, wire mail and paper holders, and a schedule board hanging right beside. The end of the hall leads directly to a pair of beautiful white French doors to the outside patio. Light wood plank floors match well with the off-white walls in this house. The mudroom features white horizontal wood planks up to about three-fourth wall height. The back wall features a set of three metallic hooks, and a simple built-up bench in white wood, with storage space below for wicker baskets. The wall terminates at the top with a framed painting, and the area overlooks the outdoors via two double hung windows. In stark contrast to the white doors, trims and walls, as well as the warm wood plank flooring, the casework for this mudroom goes for a very dark, heavy grained wood finish. Standing from floor to ceiling, the cabinetry begins with large drawers at the bottom and terminates with cabinets at the very top. The center features two open hollows with black metal hooks installed onto the vertical wood backing. The platform created here provides a usable low bench and is flanked by two tall cabinet panels on either side. The dark finished flooring in heavy grained wood provides a good backdrop to the white doors, trims and caseworks of this mudroom. Starting with 4 supportive fins at the bottom, a low bench is provided, with corniced edges. The back wall is in a vertical white painted wood installation where black metal hooks have been installed, and terminates in a corniced open top shelf supported by triangular brackets. The top shelf is fitted with a trio of board boxes for storage. This modern style house features light grey walls and off-white stone floor tiles matched with white trims and doors. 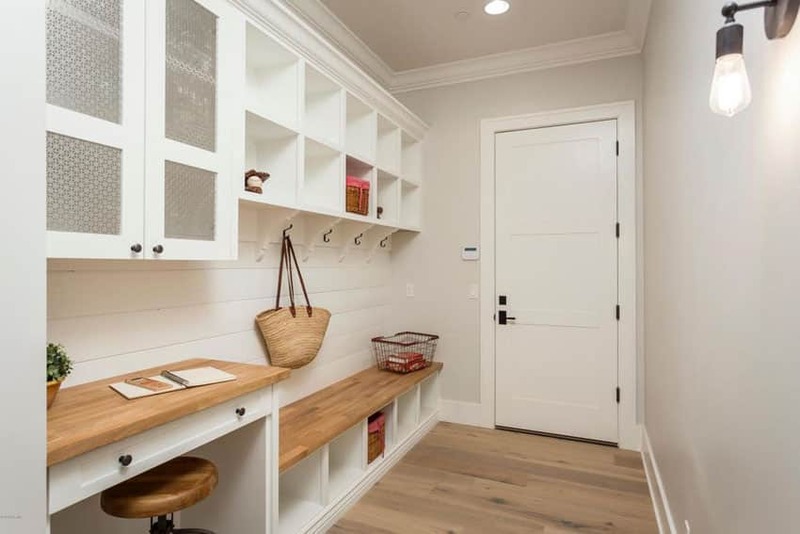 The mudroom casework goes for the same white painted finish and features recessed paneling on its below bench drawers and above bench cabinets. The low bench itself is done as an accent, with a dark wood surface. The top part of the bench cabinets feature a metal mesh panel, and above are more open shelves. Olive green walls, white doors and trims, and varied stone tile flooring in grey and brown are a good neutral base to the warm wood finish used for the mudroom casework. 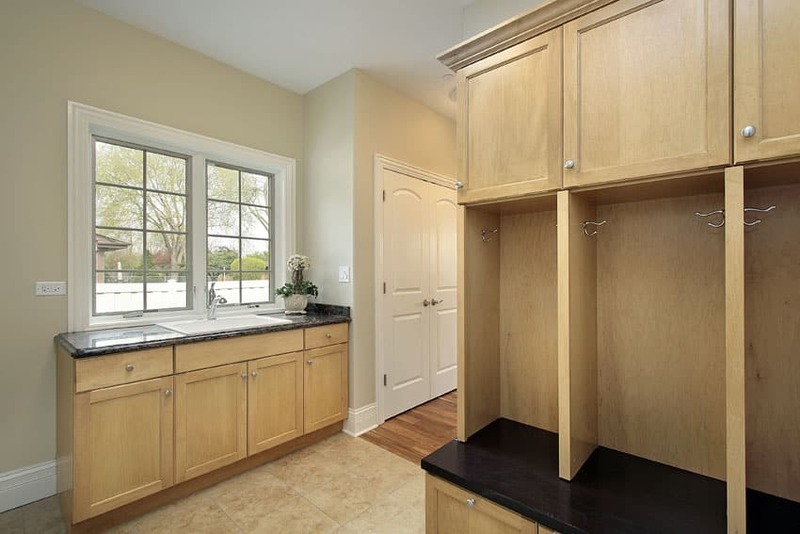 A built-up wall separates one end of the mudroom casework from the other, with one side featuring a counter mounted sink with under counter cabinets and hanging cabinets. The other side features a dual level low bench, with either a set of drawers or open shelves beneath the surfaces, made up of grey synthetic stone. Black wall hooks are mounted on the back panel, done in vertical wood planks, and terminating in another row of hanging cabinets and open shelves. A classic frosted glass and silver ceiling lamp lights up the entire space. 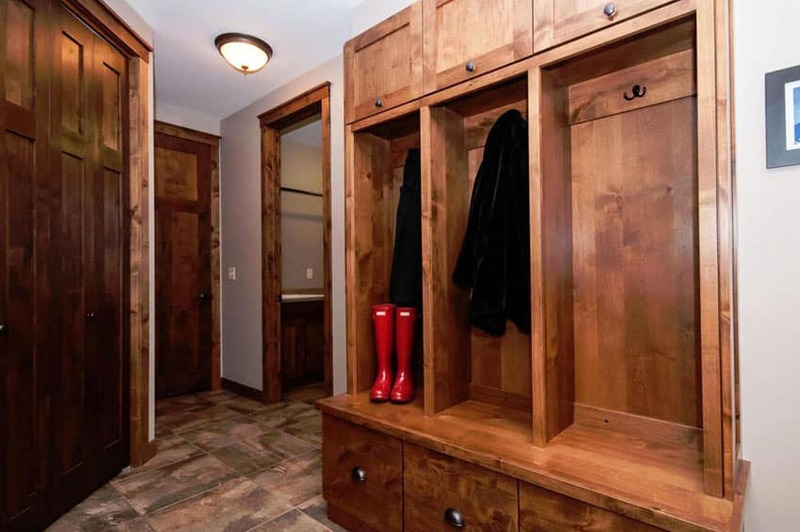 The white wood planks running horizontally along the walls as well as the midnight blue colored door with window are enough to give this mudroom a nice ski cottage vibe. 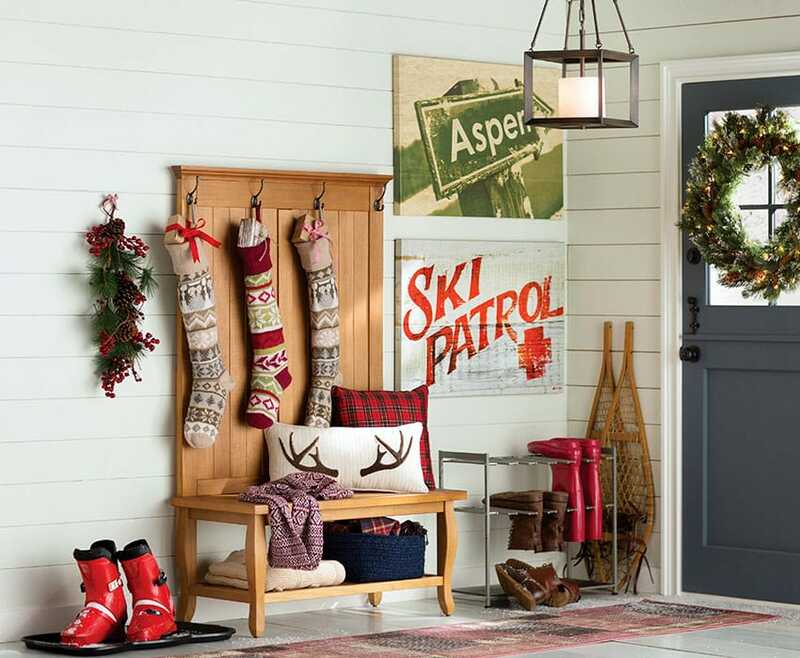 A classic pendant lamp hanging from the ceiling, as well as the faded red area rug, and snow equipment and ski paintings along the wall also add to this vibe. The Finleyville Hall Tree, seen here with its light wooden finish, serves as a functional and stylish way to accessorize your mudroom. It comes with four hooks and provides a simple low bench with under bench storage. The example here was decorated with accent throw pillows and a dark blue rattan storage basket. Click here to get more information about the wood hall tree shown in this picture. The neutral off-white tones for this mudrooms walls and stone tiled flooring are offset with the dark wood finish used for the room’s cornice and casework set. The casework, a floor to ceiling fixture done in a heavy grained dark wood, features a low bench running along the whole length of the wall. Recesses are present, with vertical wood plank backing, and hanging rails present in each. Below the low bench are a set of drawers and an open space in the center. The top most part of the casework features small raised panel cabinets. A narrow mud room features olive green walls, beige square tiles for its floor and white for its tall, narrow door, ceiling and trims. To the side, curvilinear fins cut the white painted wood casework into sections, with each having rails mounted onto the vertical white painted wood plank backing. Open shelves are created above these recesses, as well as below the low bench, all done in the same white painted wood finish. This small built-up recessed into the corner features white painted wood panels, with recessed flat panels used as backing for black metal wall hooks, terminating about three-fourths of the wall’s height. An upholstered cushion a brown diamond pattern is put over the low bench and open shelves are set beneath it. At the top of the casework is a pair of recessed panel cabinets, bordering a pair of cross-braced shelves on the center. 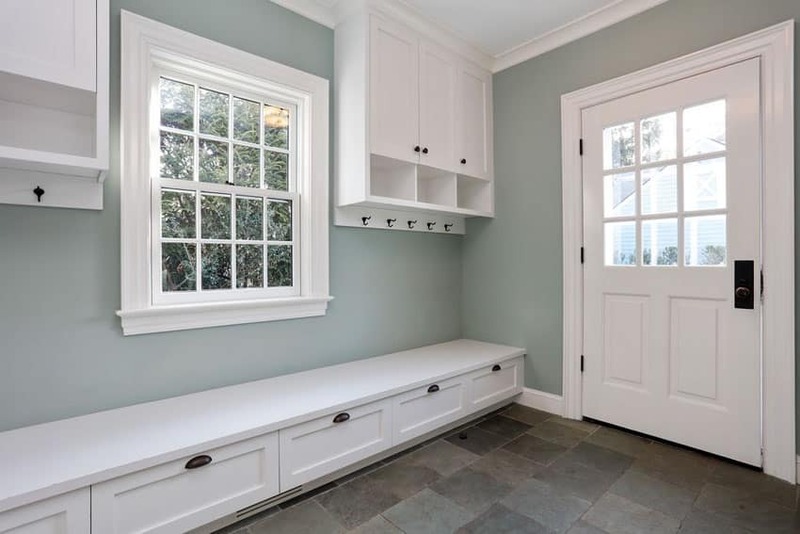 This nice cottage style mudroom features teal colored walls matching with speckled white and beige vinyl flooring and white door with mullioned window. White painted wood is also used for all the hanging cabinets in this room, as well as the trims for the baseboard and for the two high windows. A woven hemp rug is set in the middle of the room, with one corner featuring two metallic modern style washing machines, and the other side featuring a large freezer and wine chiller. A dark stained rattan basket sits to the side, perfect for laundry storage. This classic style mudroom features a rusticated cream colored floor tile, as compared to the warm wood plank flooring used in the rest of the house. Off-white walls go well with the light wood finish used for the caseworks, while the same black synthetic stone finish used for the countertop was also used for the low bench. The counter features a large barn style sink, flanked by two grey mullioned windows. The mudroom casework features recesses with wall hooks and has drawers to the bottom and hanging cabinets to the top. This vintage style mud room starts with a simple base of white for its doors and trims and light grey square floor tiles, but gains added kitsch with the roll of wallpaper along the walls’ mid-line. Adding to the vintage effect is the use of rose gold hardware for the hooks and door accessories, as well as the grey patterned area rugs. An orange-tinged wood finish was used for the casework, with hanging cabinets and open shelves filled with rattan baskets for storage. 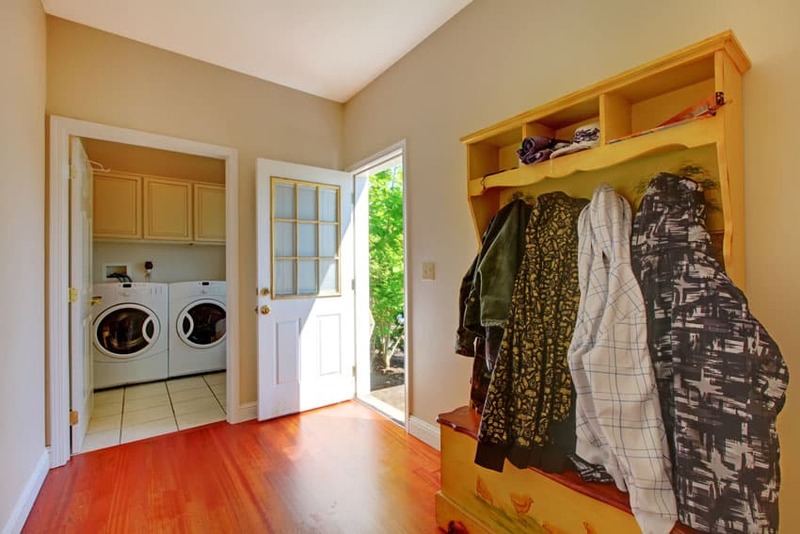 The mudroom is also done in conjunction with the laundry area, with a washer and dryer lined against the wall. This classic style house features redwood floors and beige walls, a good backdrop to the light wood used for the mudroom’s storage cabinetry. The very bottom features a wooden base with quaint duck mural, while the recess features coat hooks, lined with a curvilinear frame and culminating in a trio of open shelves at the top. 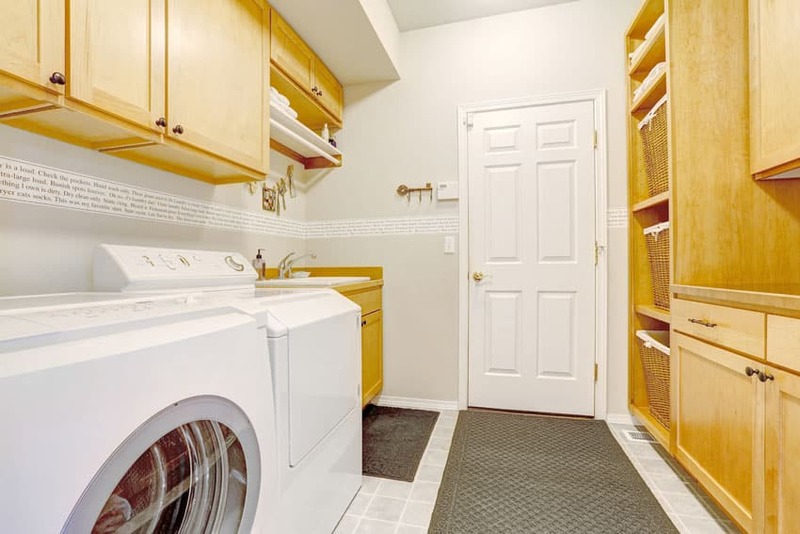 A door to the side leads to the laundry room, aptly done in white ceramic tile flooring. A bell jar candelabra hangs along this narrow hallway featuring all white walls and a dark grey tile flooring. The caseworks are all done in a painted white wood, with the exception of the low bench’s surface, done in a dark wooden finish. Open shelves are laid out on the base of the casework, with recesses featuring black coat hooks. The upper portion features open shelves, followed by recessed panel cabinets. The opposite side of the hall features wainscoting leveled with the bottom of the open shelves, also done in a recessed panel detail. 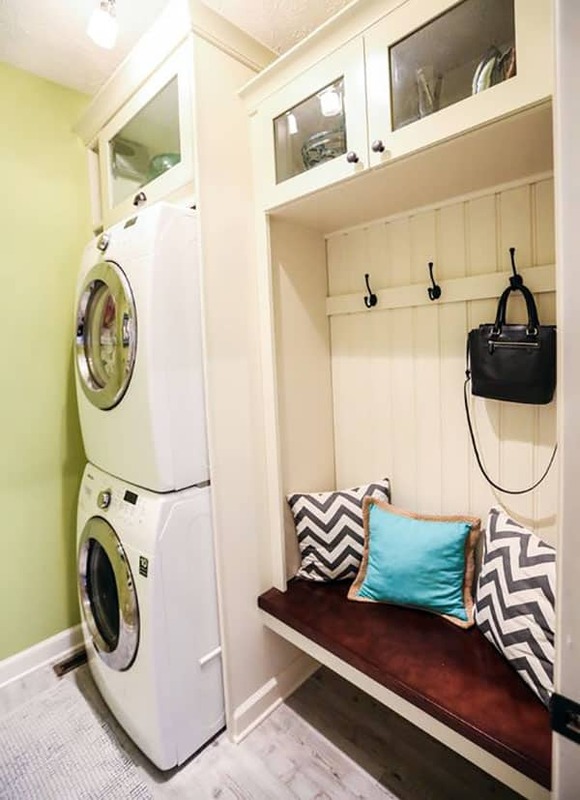 This laundry area and mudroom features a cozy built in bench with clothing hangers and overhead storage cabinet. Extra storage is located above the washer and dryer as well as room for shoes under the cushioned bench seat. Many mudroom ideas originate from a shared space such as a laundry room. 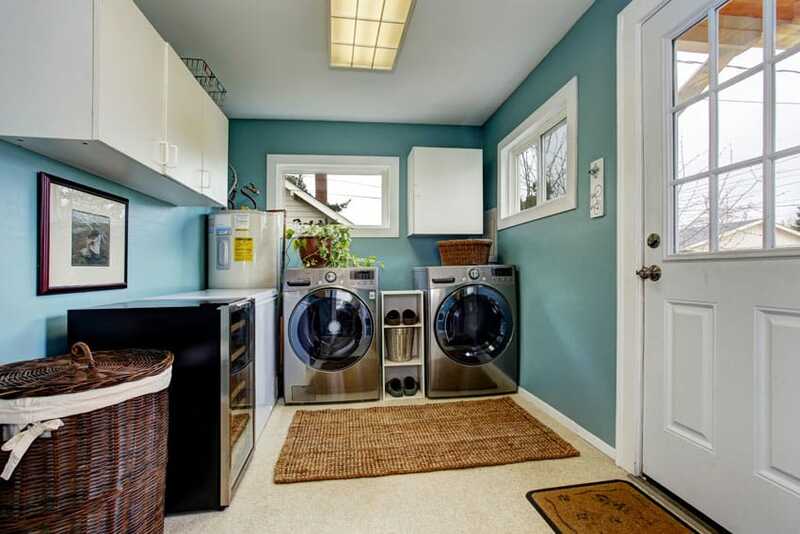 In this image a large picture window brings in a lot of natural light to this small laundry space. The layout consists of a white door concealing a double set of washing machines next to a separate storage area. 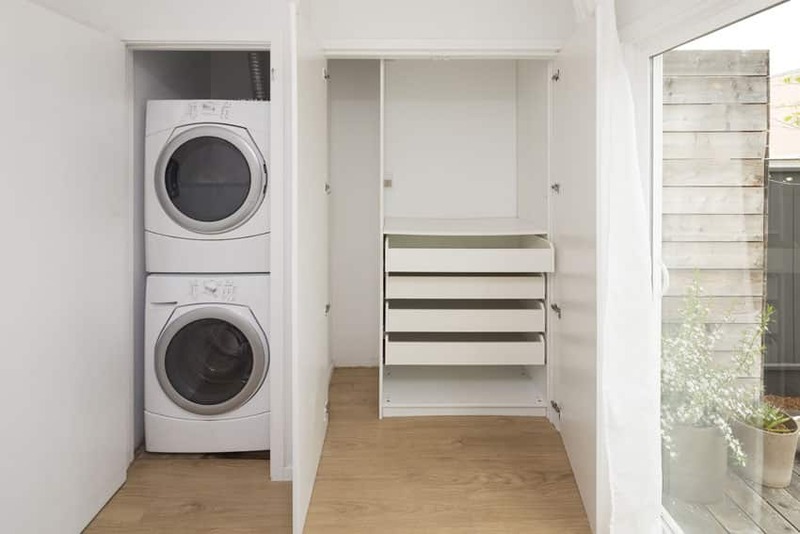 The door adjacent to the laundry conceals an good amount of storage space, with a lot of built-in drawers, as well as open shelf space below and above it. A tall uninterrupted area is also kept for cleaning materials like mops, brooms, or ironing table. The whole mudroom is finished with a pale wood plank flooring. A large mullioned double hung window lights up the entire hallway, done up in a light wood plank flooring, matching the entrance door and low bench surface of this mudroom. Below the bench are several drawers with oiled brass handles while black metal hooks are mounted onto the backing, done in a slim plank finish. Reaching towards the room’s ceiling, the casework terminates in white trim with space for a row of open shelves at the top. A nice floral patterned area rug stands in front of a portable white cabinet set in this house’s mudroom. With the house’s walls done in a pale ocean green, white was used for the baseboards, panels and wainscoting of the house’s walls. The same white painted wood finish was done for the Bedford Entryway Hall Tree featuring a low bench held up by recessed panels, its sides continuing up to a row of hooks and terminating in a pair of open shelves. The top of the shelf features a delicate cornice and can be used to store more decorative items such as a framed picture. Click here to get more information about this entryway hall tree cabinet.